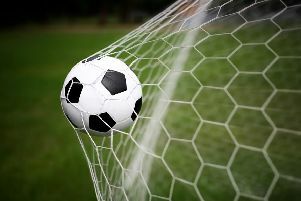 Battle Baptists boosted their Macron East Sussex Football League Premier Division survival hopes with a 5-0 home win against Rock-a-Nore. All the goals came in the second half. Mark Dowling opened Battle’s account on 53 minutes before Ben Barnett, Dean Boyd, Sam Loughman and a Scott Vickers penalty completed the scoring. Third-bottom Ninfield United pulled off a vital 3-1 win at home to Iden despite falling behind to an early Darren Warne goal. Arron Scrace, Ashley Elphick and Corey Scott turned the game around, however, and Ninfield will be safe from the drop if they beat Battle next Saturday. Third-placed Hollington United picked up their ninth league win of the season with a comfortable 3-1 home victory over Sedlescombe Rangers. Despite Pip Hatch’s goal for Rangers on the half-hour mark, Hollington still led 2-1 at the break before adding a third during the second half. Scorers for Hollington were Alan Foster, Joe Harmer and the ‘young’ Dave Grass. Hawkhurst United went top of Division One after thrashing previous leaders Mountfield United 5-0. Hawkhurst forged a 2-0 lead at the break and added three more in the second period. Kieran Eland and Danny Mcgahan both scored twice, and Scott Penfold got the other. Two goals from Mark Larkin gave Hollington United II a narrow 2-1 away win over Icklesham Casuals which moved them up to fourth. This defeat for Casuals means that anything but a win away to Ticehurst tomorrow will confirm their relegation. Phil Badrock hit Casuals’ goal to take his tally for the season into double figures. Sandhurst are almost certainly facing the drop after losing 1-0 at home to Wadhurst United. See Friday’s Observers for a full round-up of the weekend’s action.